It will be paired with the track-only DB4 GT Zagato Continuation car. Last year, Aston Martin announced the DBZ Centenary Collection, a limited run of special models designed to celebrate the Italian coachbuilders’ centenary and nearly six decades of collaborations between the two companies. The DBZ Centenary Collection compromises of two cars: a track-only DB4 GT Zagato Continuation car and a new road-legal DBS GT Zagato. Only 19 examples of each car are being built, but you can only buy them as a pair for £6 million ($8 million). At the time, Aston Martin only showed a rough sketch of the DBS GT Zagato, but now the automaker has released some detailed renders that give us a better idea what the final car will look like. Based on the DBS Superleggera, the special model features a restyled design incorporating a double-bubble roof that runs from the front windshield to the tail, replacing the rear windshield. The double-bubble theme continues at the front as a nod to early Zagato designs, while the striking grille, unique headlights, and wheels hark back to the original DB4 GT Zagato. 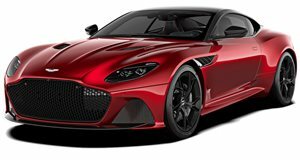 Aston Martin hasn’t revealed any technical details, but it’s probably safe to assume the DBS GT Zagato will retain the regular car’s twin-turbo 5.2-liter V12 engine with 715 horsepower and 663 pound-feet of torque on tap. In the regular version, this setup propels the lightweight supercar from 0-62 mph in around 3.4 seconds before it maxes out at 211 mph. The DB4 GT Zagato Continuation, on the other hand, will have a straight-six engine sending 380 hp to the rear wheels through a four-speed manual transmission and limited-slip differential. "In the DB4 GT Zagato Continuation, we have one of the world’s most beautiful and instantly recognizable pieces of car design. Creating a car fit to stand alongside it was always going to be a formidable challenge, but also a great motivation,” said Marek Reichman, Aston Martin Lagonda’s Executive Vice President and Chief Creative Officer. Customer deliveries for the DB4 GT Zagato Continuation will kick off in Q4 2019, while DBS GT Zagato deliveries start a year later in Q4 2020.